Hey hey! Welcome to an extra special and unusually rare edition of Wednesdays With Lazerbeak. First off, enormous shouts to any and every one of you who went out yesterday and voted to make your wonderful voice heard. I can’t thank you enough for that. Legend Recognize Legend, for real. In celebration of getting out the vote, how about some epic new Doomtree announcements???!!! 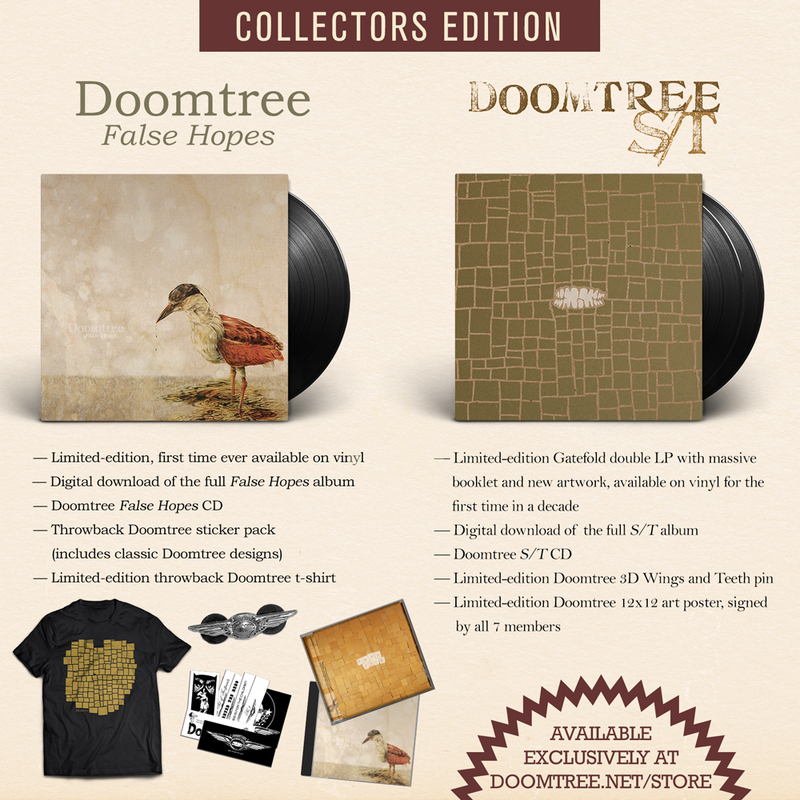 2018 marks the TEN YEAR ANNIVERSARY of the first two Doomtree crew albums: S/T and False Hopes. In honor of hitting that great double-digit milestone, we’ve decided to reissue both albums on vinyl for the first time in FOREVER. 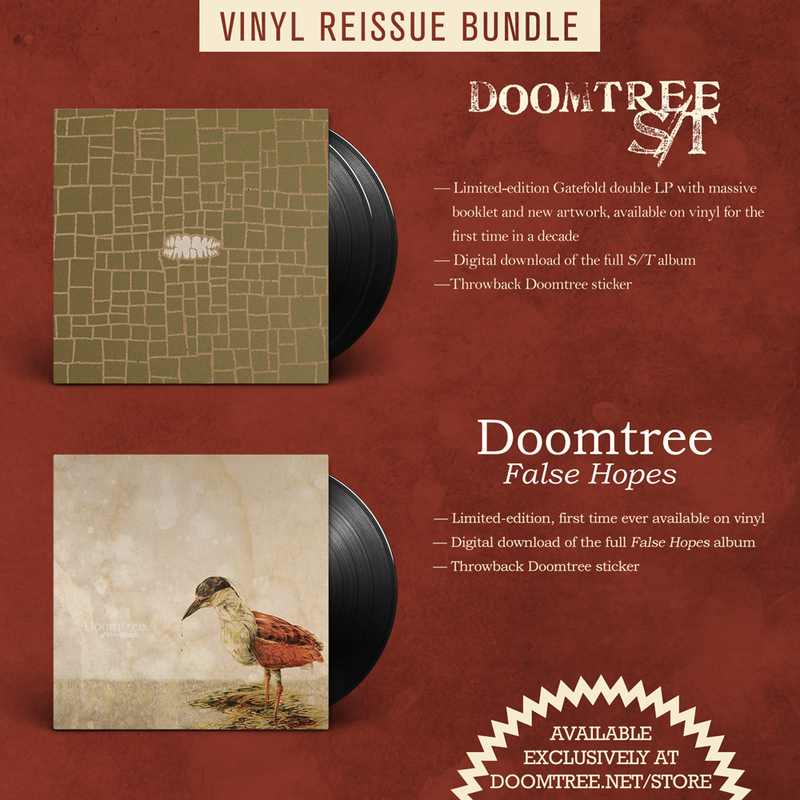 Doomtree False Hopes has actually never been released on vinyl until now, and we only ever printed 300 copies of the Doomtree self-titled album back on its release in 2008. Suffice to say this is a big deal, folks! Both albums will be physically re-released on December 14th, but you already know we’ve got some super crazy pre-order bundles available to you at the Doomtree Webstore starting RIGHT NOW. In addition to pre-ordering each standard record individually, you can also bundle the two together and save yourself some serious money. Check out the reissue bundle below and grab yours right HERE. Then again, if you live your life by the age-old motto “Ball Til You Fall,” have we got the package for you. The Collectors Edition pre-order is limited to only 200 total packages and makes a perfect gift for the upcoming holidays. You’ll get both reissued LPs, their original CD counterparts, a new throwback Doomtree t-shirt (designed by original founding member MK Larada and printed only for this pre-order), a very special 3D Wings and Teeth pin available only to this pre-order, a big sticker pack of all our old throwback Doomtree sticker designs, AND a limited-edition 12×12 Doomtree screenprinted poster signed by all seven members of the crew (only 200 copies ever made). OH MAN OH MAN!!! 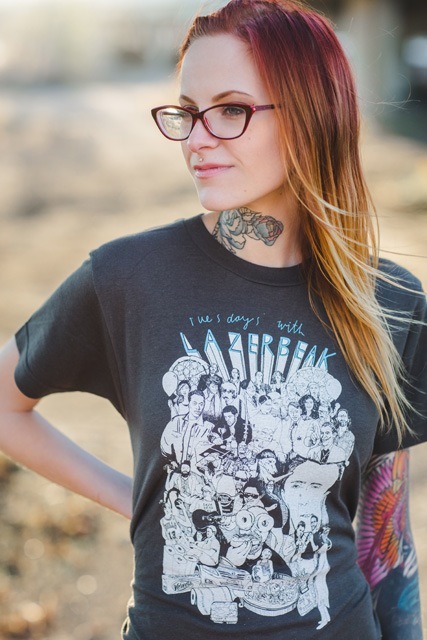 Check out all the sweet deetz below and then go grab yours right HERE. We’ll be doing a lot of walking down memory lane over the next few months as we celebrate the big ten-year birthday of these two projects. For starters, here’s the infamous As Seen On TV videos that we made to promote the first-ever Doomtree crew album. Still can’t believe these are real to be honest. Really incredible work. ENJOY! 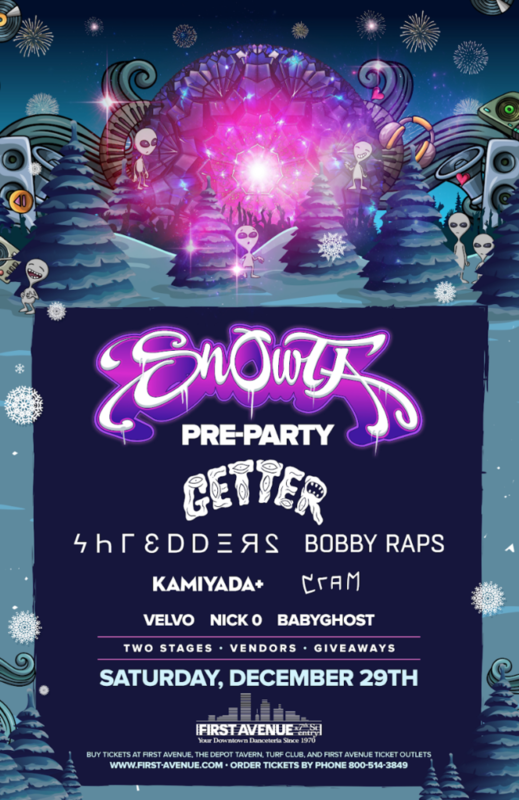 In other holiday news, it has just been announced that Shredders will be performing at the legendary First Avenue Mainroom on December 29th to kick off the big Snowta Pre-Party weekend. Getter, Bobby Raps, Babyghost, and a whole slew of other artists are on the packed bill as well. Tickets officially go on sale to the public this Friday and you can grab yours right HERE. Can’t wait for this one! Speaking of awesome shows (SEGUE!!! ), Four Fists continue to traverse this great country on their #6666 World Tour. Stef and Andy wrapped up the southern leg this past week and are now making their way up the East Coast. 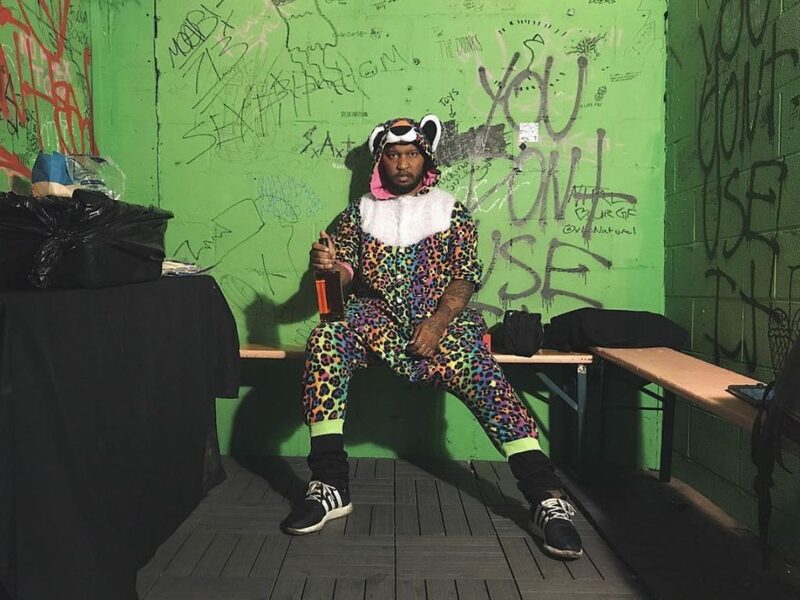 Here’s Stef in Austin on Halloween night dressed as a Lisa Frank trapper keeper. Nailed it. Angel Davanport posted up backstage before slaying yet another main support slot. Don’t sleep on her!!! Get to these shows early. 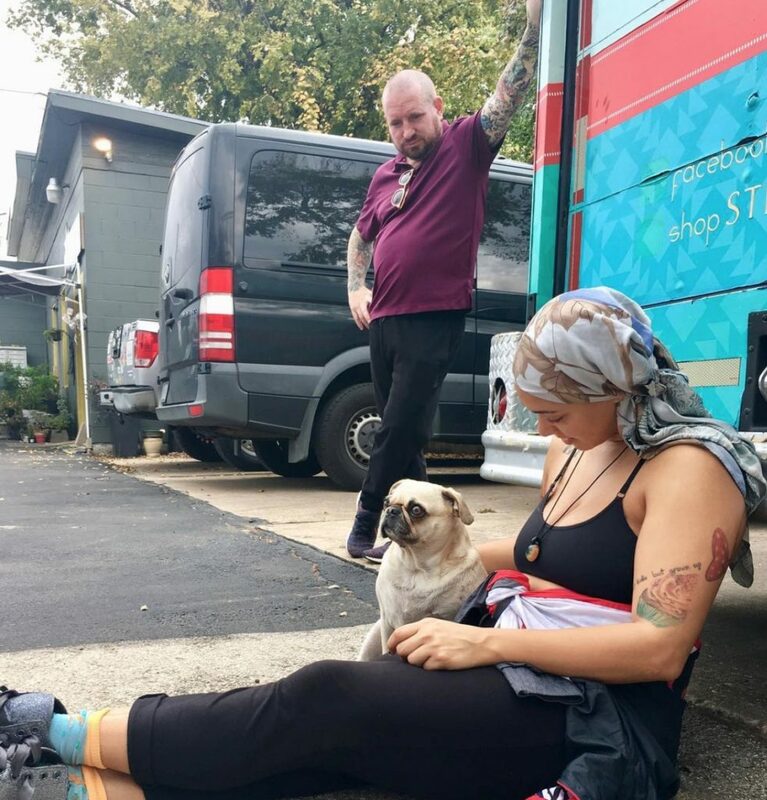 Tour manager Brock having his whole damn mind blown by Angel’s dog whisperer skills. Brock letting the good times (and endless chips and salsa) roll. 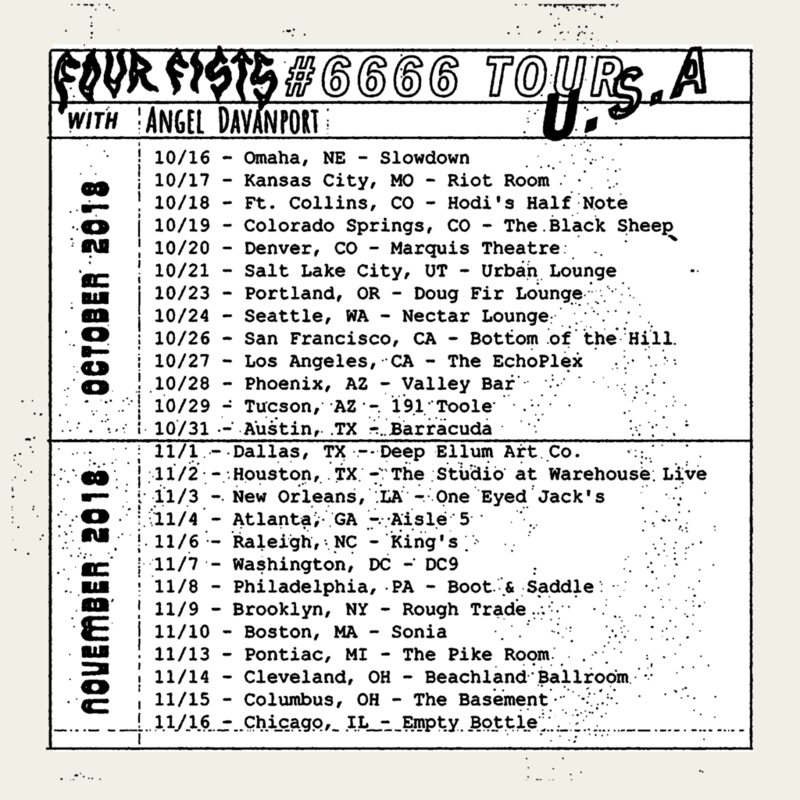 This week Four Fists will be hitting Raleigh (11/6), DC (11/7), Philly (11/8), Brooklyn (11/9), and Boston (11/10). Check out the full US routing below and grab your tickets right HERE. 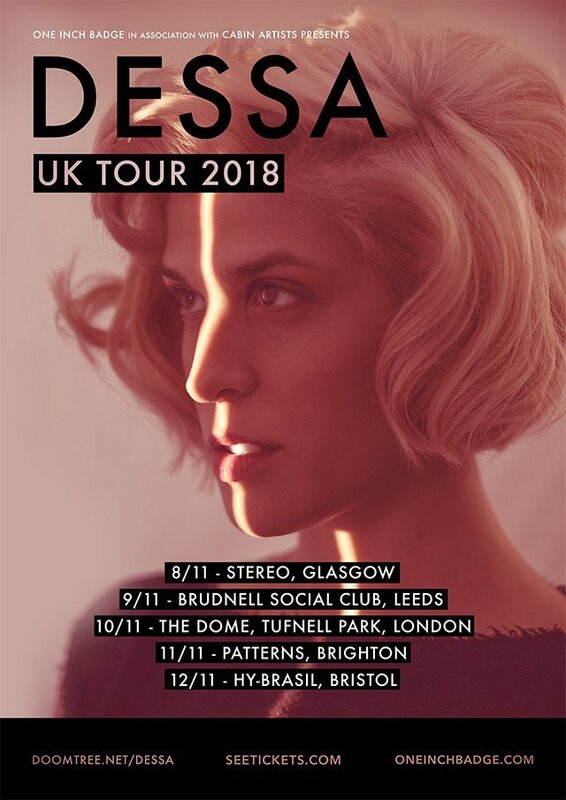 Dessa has been wrapping up her US book tour dates over the past week. 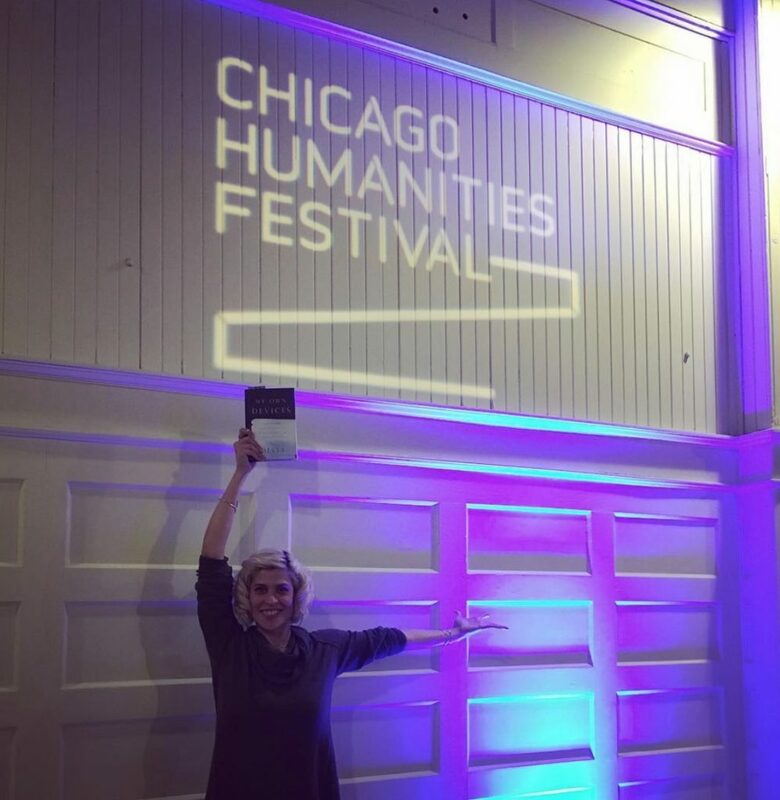 Here she is in Chicago repping My Own Devices hard at the annual Chicago Humanities Festival. 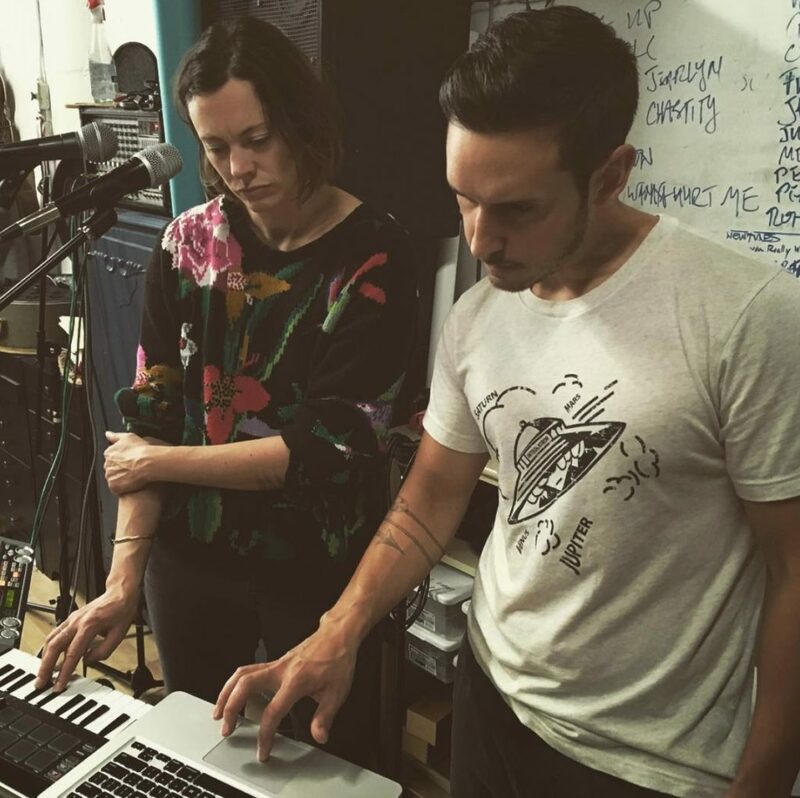 And here’s a quick snap of Aby Wolf and Matthew Santos working on the Dessa set before they all head overseas for a week of UK dates. The gang is actually in the air as we speak and will be playing shows in Glasgow (11/8), Leeds (11/9), London (11/10), Brighton (11/11), and Bristol (11/12) this week. Check out all the details below and grab those tickets or tell a friend HERE. 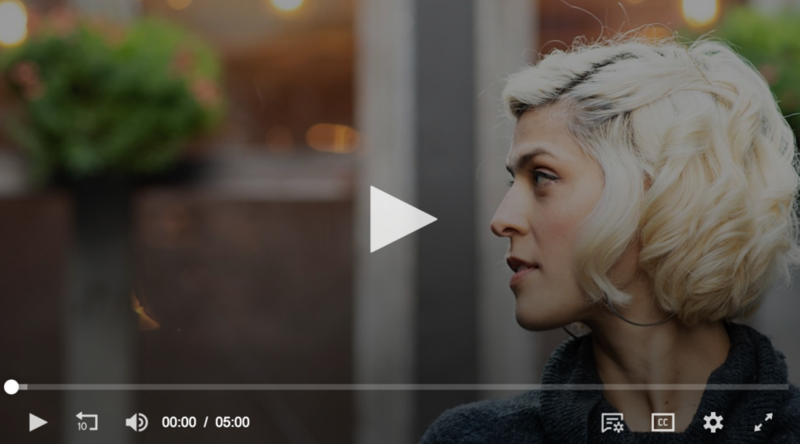 And speaking of Dessa (SEGUE II), the good people over at TPT just put together this feature piece on her and My Own Devices. Click the player below or go right HERE to check out the five-minute clip and learn more about the making of this book. Now for some CLOQUET news! Have you heard this incredible record yet?! If not, I implore you to check it out right HERE. Paper Tiger recently sat down to give us a big tour of his home studio where all the production for the Cloquet album was made. Check it out below. This studio also doubles as my bedroom whenever I visit NYC, so I’m extremely partial to it. One quick little random note on my end. I’ve partnered up with NE Minneapolis school Slam Academy to help co-teach their new Music Industry Program alongside Grace Davies and Kate Kramaczuk. The class kicks off this Monday night (11/12) and you can learn more about what it entails and the enrollment options HERE. You can also read a Q&A with me on what I’ll be bringing to the table for this program right HERE. Should be a total blast. Hope to see some of you on Monday night! And in final Doomtree-related news, I want to highlight this excellent new Heart Bones song from the dazzling duo of Har Mar Superstar and A Giant Dog’s Sabrina Ellis. Har Mar and Sabrina will be touring the country next month performing the beloved songs of the Dirty Dancing soundtrack and debuting some new originals as well. “This Time It’s Different” is the first single they’ve made public and I was very honored to contribute some production work to it alongside a dream team of BJ Burton, Aaron Baum, and Ryan Olson. Check out the track below. Lots more to come from these two! 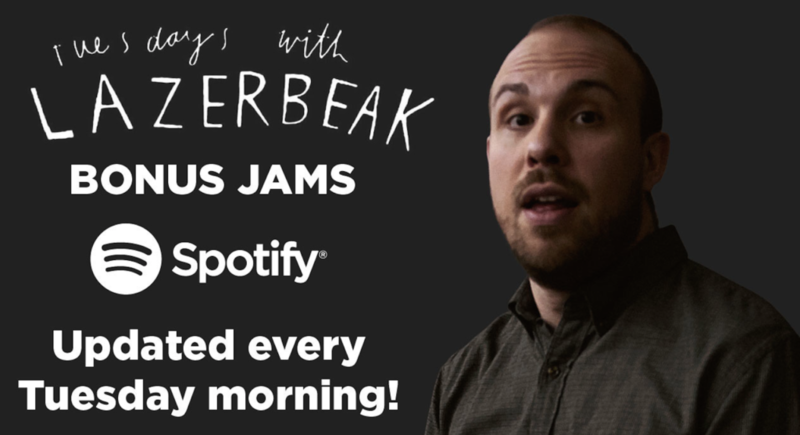 While we’re at it, let’s break into a brand new edition of Lazerbeak Bonus Jams!!! As always, you can save my Spotify Bonus Jams Playlist right HERE in order to take all these heaters with you wherever you go. I update it every week with new flames. Man, last week saw some heavy hitters dropping complete smash hits out of nowhere. The fourth quarter is really heating up in the music industry. First up, Ariana Grande. She surprise released what may be her best song of all time on Saturday night. Absolutely incredible. To be honest, I never really connected with Sweetener, but this song has me fully back on board. Check it! One of my all time favs, Carly Rae Jepsen, also dropped a new single called “Party For One” and it’s everything I’ve come to expect from her. Phenomenal production, 80s throwback vibes, mammoth hooks. I cannot wait for her next album. Mariah Carey continues to leak singles as the buildup to her new album reaches a fever pitch. The only song I’ve been 100% floored by was the collab with Ty Dolla $ign, but this “A No No” one is definitely growing on me. Trey Songz dropped a new single last week produced by my new favorite R&B producer Hitmaka (that man cannot miss these days!). It’s great and also features excellent cameos from the aforementioned Ty Dolla $ign and Toronto’s own Tory Lanez. Of all the big time albums that dropped last week, I actually think the Metro Boomin album takes the cake. There are some serious jams on this one and the production is next level. It also has the best album cover/album title of the year, no question. Definitely been digging the new Vince Staples surprise release. Here’s yet another excellent music video from him for the standout single “FUN!”. Waaaaaaaay into the new album from Spanish singer Rosalía. This record does a crazy good job of blending modern R&B and pop production with the more traditional flamenco stylings of her upbringing. These types of hybrids always have a high risk of going haywire, but Rosalía pulls it off flawlessly. So good. Now for some hometown Bonus Jams from our beautiful state of Minnesota. David Huckfelt from The Pines is gearing up to drop a brand new solo album this fall and everything I’ve heard from it to date is wonderful. Check out lead single “Stranger Angels” below. Huge shouts to MN legend Maria Isa on releasing her new album #SASA yesterday. I can’t wait to dive into this one. 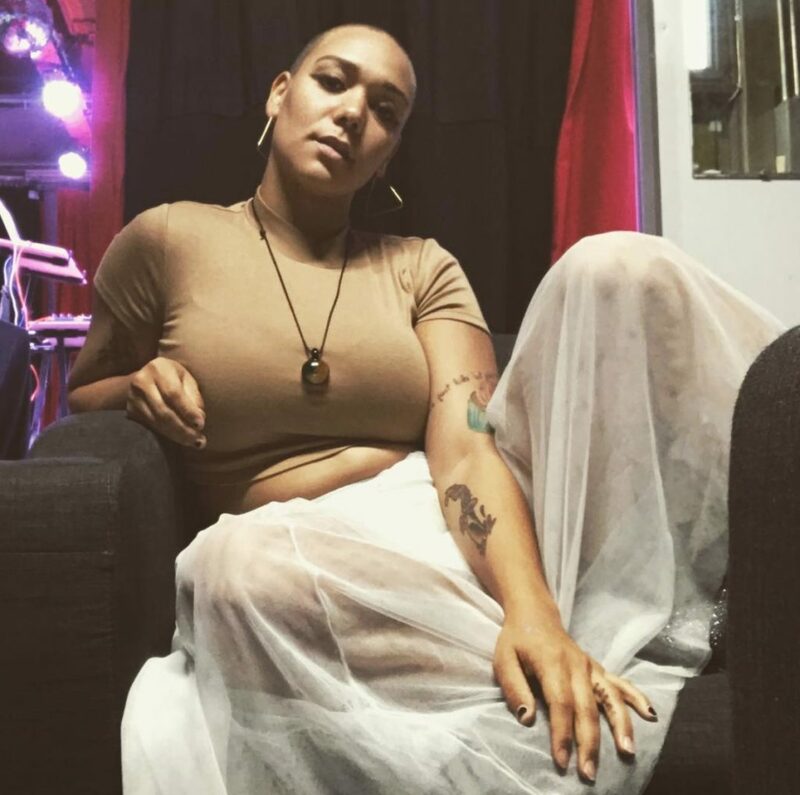 In the meantime check out the video for her new single “Confusion” below. She’s one of the brightest lights we’ve got in this community and an incredible activist on top of being an incredible artist. Love her. I’m extra excited about this new collab project from producer Shrimpnose and vocalist K. Raydio. If this “Bully” single is any indication, these two are sitting on some heat rocks! 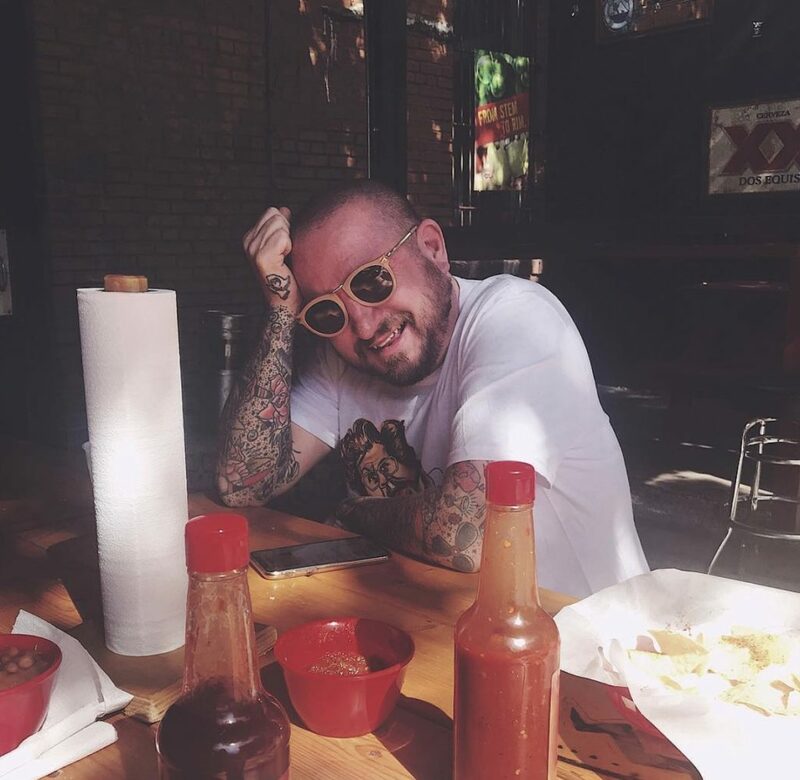 astralblack member and synth virtuoso MMYYKK released his debut solo full-length last week and it is absolutely beautiful. So much going on with this one – layers upon layers of intricate keys and vocals. I can’t get enough of it. Allan Kingdom dropped a brand new single and video for his track “Energized.” Check that vizual out below. And lastly, OG Grip and Muja Messiah released their collaborative album entitled MuOG last week. Congrats to both of them. I’m loving this “Dog Days” song and video. Can’t wait to check out the rest of the project. BOOOM!!! That does it for this post. I hope you all have an excellent week. Make sure to grab your Doomtree vinyl pre-order right HERE and I’ll see you back here next week for another round of Tuesdays With Lazerbeak!